The following text is replicated courtesy of the RNLI. Kind-hearted staff at The Co-operative Group’s food stores have donated £30,000 to the Royal National Lifeboat Institution (RNLI) after staging several fundraising events last year. Workers at 67 stores across the North region raised the money, which was presented to crew at the RNLI’s lifeboat station in Whitby, by holding charity car washes, fancy dress fundraisers and raffles, as well as fun days and party nights. Iain Hume, The Co-operative Group’s Regional Operations Manager, said: 'It is fantastic that our staff, members and customers really got behind our fundraising efforts and helped collect £30,000 for the RNLI. The RNLI, founded in 1824, is a registered charity that saves lives at sea and provides a 24-hour lifeboat search and rescue service around the coast of the UK and Republic of Ireland. 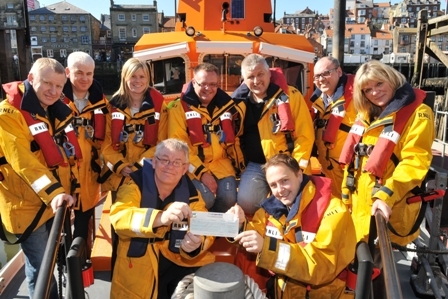 The Co-operative Group’s Operations Manager, Andrew Thompson (front right), presenting a cheque to Glenn Goodberry, mechanic at the RNLI’s Whitby Lifeboat Station. Also pictured, back row from left, are: The Co-operative’s Dave Blackburn, Operations Manager; Dave McQueen, Operations Manager; Joanne Armstrong, Regional HR; Iain Hume, Regional Operations Manager; Chris Evans, Operations Manager; Mike Frankland, Operations Manager; and Catherine Kaye, the RNLI’s Regional Corporate Partnerships Manager.